ABOVE: Transforming your outdoor areas needn’t be a daunting task. Investing in a few simple and cost effective measures can go a long way in improving aesthetics, comfort and services for guests. 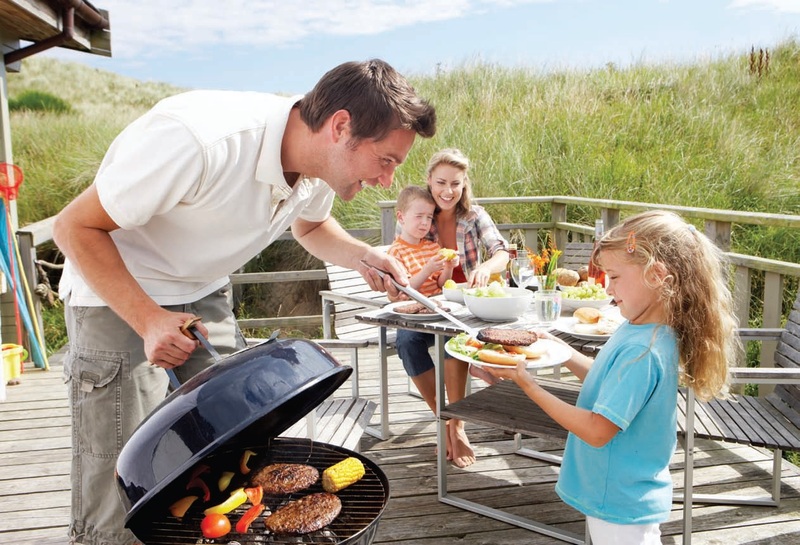 Switched on holiday park operators who maximise the outdoor experience will ultimately reap the rewards…. It is estimated that the average person spends 90 per cent of their time indoors; at work, at home and in recreational settings. In fact, research by NetVoucherCodes.co.uk found that the average UK resident now spends nine hours every day glued to a computer, phone or tablet screen - a shocking total of 30 years throughout life. With that in mind, it’s no wonder that the outdoor experience of a holiday park or campsite stay appeals to so many of us. A chance to escape the daily work routine and enjoy the fresh air, activities and associated benefits of being outdoors for a few days each year. Switched-on park owners, who optimise their outdoor offering, can reap rich rewards from holidaymakers who will pay extra for high-spec facilities and luxuries. From outdoor hot tubs to stateofthe-art furniture, fitness and play equipment, making the most of your outdoor areas can be a wise investment. Transforming your outdoor areas needn’t be a daunting task. Investing in a few simple and cost effective measures can go a long way in improving aesthetics, comfort and services for guests. 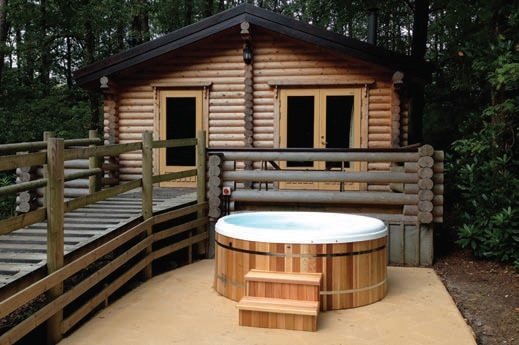 ABOVE: Designed as a hybrid hot tub, Urban Cedar’s Sport range combines the stunning looks of a solid wood hot tub with the comfort, lower maintenance and lower running costs of a modern polymer hot tub. “A well-maintained outdoor area is essential and helps set the bar high,” says Hanna Latham, marketing manager at Besp-Oak Furniture. “Park competition is fierce and by having a safe, clean and tidy outdoor area, guests are more likely to appreciate their surroundings and will return year after year.” Coventry-based Besp-Oak Furniture is a trade only supplier of indoor and outdoor furniture, accessories and lighting. New to the market this year is the wicker and furniture range plus a selection of decorative water features. Hanna adds: “Bringing the outside in and the inside out is all the rage at the moment. Outdoor wicker and rattan furniture for example, can transform an ordinary outdoor space into an openair living room that adds value and comfort all year round.” Besp-Oak also offers two eco patio heater models – the ECONRG3 and the ECO-MEDIA which are ideal for decking, patios, balconies and smoking areas. Both models use carbon fibre heating technology which significantly reduces running costs and cuts carbon dioxide emissions by up to 50 percent in comparison to standard gas patio heaters. There is no better way of enhancing and enriching an outdoor space than by investing in play equipment. Creating an innovative play space that fires a child’s imagination and creates a pleasant environment for parents to get together is a winning formula for holiday parks. 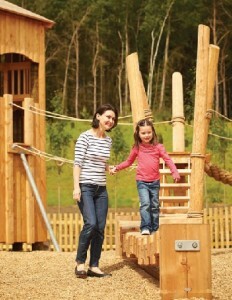 “It is not only the play equipment that goes into creating an exciting play space. 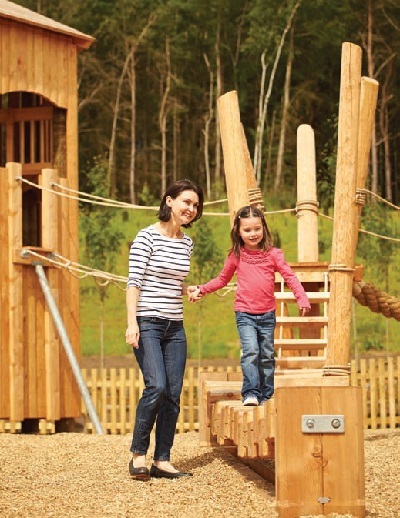 The landscaping, mounds, planting and surfaces can also be very effective in boosting play value - often for a fraction of the cost of the equipment,” says Paul Collings, managing director at Timberplay. He continues: “Waterplay is very popular at the moment as it offers excellent play value and delights children of all ages. Timberplay was an early advocate of the natural play movement and its equipment is designed to offer multiple levels of challenge, to stimulate children across a wide age range. Last year Timberplay was involved in the provision of the outdoor play facilities at Center Parcs Woburn. One of the play areas, situated at Huck’s Diner has a bespoke tower at its centre, with multiple slides and climbing nets. This unique combination provides a variety of heights and graduated challenge, making it perfect for children from the very small through to pre-teens. Toddlers also have dedicated robust equipment, in the form of swinging horses and trim trail equipment, platform houses, slides and a climbing net. A smaller play area at the village, near to the Sports Café, features one of the first dwarf castles installed within the UK. The tower enables younger children to experience the exhilaration of climbing, honing their skills before they move onto the bigger equipment at Huck’s Diner. Family-run Play & Leisure has recently expanded its product catalogue with the launch of the Zone outdoor fitness range. Ideally suited to holiday parks, the range includes standalone equipment such as the Leg Push, Dip Bars, Walker, Slalom, and Sit Up Bench plus the complete Fitness Station. Vicki Buckley of Play & Leisure comments: “A great way for guests to keep fit in the fresh air, the Zone fitness range is specifically designed to improve muscle tone, stamina, balance, coordination and flexibility. It offers a variety of exercise at different levels of difficulty to work out the whole body.” Play & Leisure specialise in the manufacture of outdoor play Overlooking one of the valleys in Mid Wales, Play & Leisure’s bespoke four tower mountain range unit and two seat swing has become a popular attraction for families holidaying at Bryn Uchel Holiday Park in Powys. The experts at Play & Leisure were commissioned to turn the park owner’s play area designs into reality and worked closely with the local planning officials to ensure that the play zone was sympathetic to the natural surroundings. Vicki Buckley of Play & Leisure explains: “Work was carried out outside of peak season to reduce the impact on the holidaymakers at the park. The park re-opened for the summer season and has been well received since.